A UDRP was filed at the National Arbitration Forum (NAF) against the valuable IMI.com domain name. The filing can be seen at UDRPSearch.com, and it is case #1753342. IMI.com was created in March of 1994. The domain name is currently registered to a California-based company. Using the DomainTools Whois History Tool, I can see Whois records since 2000. The email address on the earliest record in 2000 matches the email address of the current registrant, so the registrant has had it for at least 17 years. 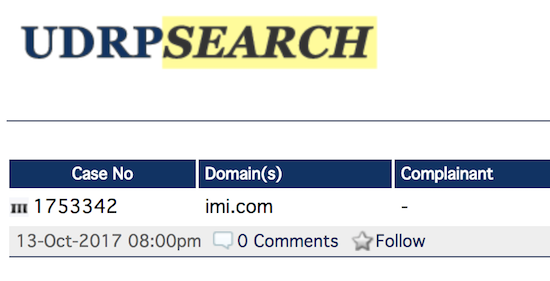 Interestingly, there is a page within the website that says the IMI.com and IMI.info domain names are for sale. There is absolutely nothing wrong with selling valuable domain names like IMI.com (just ask a publicly traded company like GoDaddy which has sold many millions of dollars worth of generic domain names like this one). The price may seem high (“offers less than two million dollars will not be considered.”) but a domain name owner can ask whatever price he or she wants and there is nothing wrong with that. Domain owners have the right to ask whatever price they want for their assets and if someone thinks it is too expensive, they can go find something else within their budget. That’s how it works – just like real estate. Because there are so many possibilities and so many registered ccTLDs, gTLDs, and other extensions with IMI in them registered, I wouldn’t even venture a guess on who filed the UDRP. There have been quite a few UDRP filings for three letter .com (LLL.com) domain names this year. Almost all of those were won by the domain name owner, with the exception being where the panelist ruled a domain name was stolen or something to that effect. I do not see how a complainant could prove that the domain name was registered and is being used in bad faith. I would be curious to see if the complainant tried and failed to buy the domain name or otherwise balked at the $2m price tag (using the UDRP as a “Plan B.” I don’t recall seeing that tactic work before. I will keep my eye on this UDRP as I do with all UDRP filings against valuable generic domain names like this one. Update: In a surprising decision (to me), the domain name was ordered to be transferred to the complainant, Irving Materials, Inc. The domain name registrant did not respond to the complaint. I wrote about the IMI.com UDRP decision. I don’t see how a UDRP can succeed against a generic LLL unless the three letter combo is trademarked. Not an easy thing to do. I recall the litigation between the World Wildlife Foundation and the World Weestling Feferation over WWF. It took years. My guess is someone is seeking litigation leverage to try and drop the asking price. there are 64 live TM’s in the TESS database for IMI. Some tm owners my hold multiple tms for different cats. THose are your likely suspects. ANybody else may be on a pipe dream. But they still have hurdles. Hopefully the “seller” didnt create any bad faith, NAF can be a real btch.